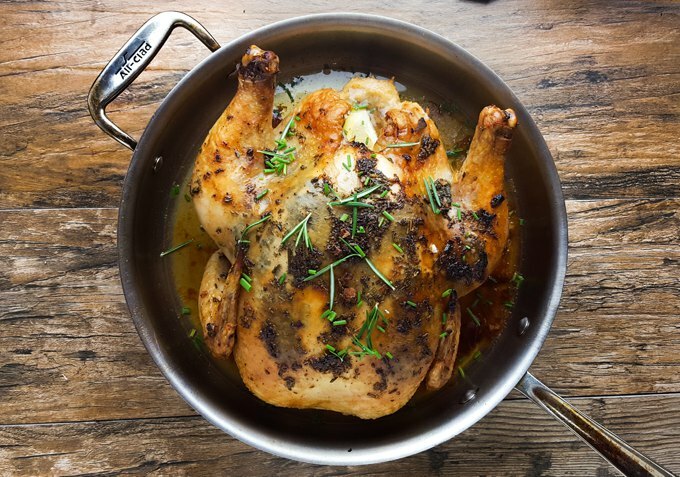 Dear Food Geek, what’s the best way to roast a chicken so that it’s flavorful and not dry? I like to stuff a bunch of fresh herbs under the skin, which adds quite a bit of flavor. Take it up a notch and slather it with herb butter and it’s hard to not love it… unless you dry it out. To make sure that doesn’t happen, we use some clever cooking techniques for this roast chicken. Thank you, science (and Cook’s Illustrated)! First, place it in a pre-heated oven-safe skillet to get the thighs a head start on cooking. Now here comes the real trick: cook it to 140 degrees in a 450-degree oven, then turn the oven off to let it finish cooking. This cools the outside of the chicken surface, reducing moisture evaporation, while letting internal temperatures to continue to rise. Since the temperature of the meat rises more slowly at the end, it’s harder to overcook. It’s very important to use a leave-in thermometer, so you don’t lose heat by opening the oven door to check on it. You also want to make sure the thermometer is placed well to get accurate temperate readings. At the end, add some fresh squeezed lemon juice to the herb-butter pan drippings for a bright pan sauce or gravy. 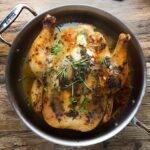 Slathered in herb butter and finished with slow heat - yields an always juicy, super tasty roast chicken. Preheat the oven to 450 and place an oven safe skillet in it to preheat too. Mince the garlic and herbs. Set aside a pinch of each herb to use later in the sauce. Combine the remaining herbs and garlic with softened butter, salt and pepper. I found this easiest to do with my hands. Rub the herb butter under the skin, all over the chicken breast meat and legs. Then finish with the last little bit on top of the skin. Place your thermometer in the chicken. Use hot pads and take the skillet out of the oven. Place the chicken in the skillet, breast side UP. Return to oven. Cook to 140-ish degrees. Then turn off the oven to let the chicken finish cooking to 160-165. Remove the skillet and chicken from the oven. Take the chicken out and set aside. Pour the pan drippings into a heat proof container. Wait a few minutes for the fat to float to the top. Skim off 2 Tbs of fat and return it to the pan, with the burner on medium-high. Add the shallots and cook until softened, about 2 minutes. Meanwhile, skim the remaining fat off the top of the dripping and discard the fat. Keep the drippings! If you don't have 1 cup of drippings, add chicken stock to get 1 cup. Add in the mustard. Add 2 Tbs flour to the pan and whisk constantly until it smells toasty. Then slowly whisk in 1 cup of the drippings. Add a splash of wine and continue to whisk. Remove from heat, add in lemon juice and a pinch of leftover minced herbs. The chicken has rested, so now you can carve it. Serve with pan gravy. Gravy – If you’re new to making gravy, let me assure you, it’s actually quite easy. Here’s a 1 minute video from the NY Times. And if you end up with lumps, don’t fret, just run it through a strainer at the end. To separate fat from the pan drippings, put it into a heat-proof container (like a pyrex measuring cup), and strain off the fat. Thermometers – Once you start cooking meat with a thermometer, you’ll never go back. Just 1-2 minutes of extra cooking time can overcook meat by 5 degrees. Or 5 minutes too long and the meat dries out and over cooks by 10 degrees or more. Crispy skin – Starting the chicken in a hot oven crisps the skin up nicely. It shouldn’t burn, but if it starts to get too dark, tent it with tin foil. The skin adds about 25 calories per serving (the skin for 1 whole breast is about 50 calories). Leftovers – turn it into chicken salad for sandwiches, moroccan chicken stew, chicken tacos, or use it in a salad (like a cobb salad with chicken). Of course, classic mashed potatoes are always a great option. A baked potato loaded up with some veggies works well too, with less fuss. For a lighter dinner, try a side of sauteed or roasted seasonal vegetables. The gravy goes well with a lot of vegetables, and it’s easy to double (keep 2x the amount of fat, 2x the flour, and 2x the stock). For some carbs, serve the chicken over some whole grains with vegetables and gravy. I roast chickens quite often, sometimes two at a time, because I love the many uses for leftovers. The herb butter recipe credit actually goes to Sarah over at The Gourmet Gourmand, and the cooking method is from Cooks Illustrated. 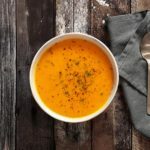 If you like this cooking method, definitely head over to the Cook’s Illustrated site (or sub to their magazine) – their whole approach to cooking is all about the science.